The British government has been angling for a Brexit that leaves the UK with a close relationship with the EU, though given the steadfast redlines of the EU, not to mention the opposition of the small but significant cabal of Brexiteer MPs, the only way this could move forward would be if the British government concedes its proposal for a UK-EU single market for goods and agricultural products in place of a free trade agreement. The main obstacle in this scenario, however, is the Irish border issue — that is, how to maintain the political imperative for a free flowing border. Dublin and the EU poured cold water on ideas to solve this issue that were unveiled by the pro-Brexit European Research Group yesterday. The softest Brexit option would see the UK exiting the EU but remaining in the EEA (European Economic Area), similar to the Norway model, but unless the UK maintains membership of the customs union (which Norway doesn’t), it won’t satisfy the Irish border problem, while the political viability of this option in the UK is questionable as the Labour Party has rejected it while the Brexiteer cabal is staunchly against it. The UK position is likely to end up a defacto pro-Canada-plus type of deal with the EU (i.e. a more traditional third country free trade deal with added benefits), although the government’s official position remains against this. Another referendum would be one way to break the political deadlock. The option for leaving the EU without a no new deal is unlikely; a scenario that the UK parliament will work hard to prevent. Moody’s warned about a no-deal Brexit scenario, which barely caused a ripple as the risks are well known and the UK parliament and EU member states will have a high priority in avoiding such an eventuality. So far today, the Pound is trading with little directional bias, presently sitting at near net unchanged levels versus the Dollar and Euro while showing a modest loss to the underperforming Yen. Cable has settled above 1.3000 after recent bouts of Brexit-related volatility, holding below recent highs at 1.3085-88. Sterling is expected to remian in turbulence airs for some time yet, while on today’s BOE meeting is likely to remain unaffected overall, as no changes expected to settings or guidance at this juncture . 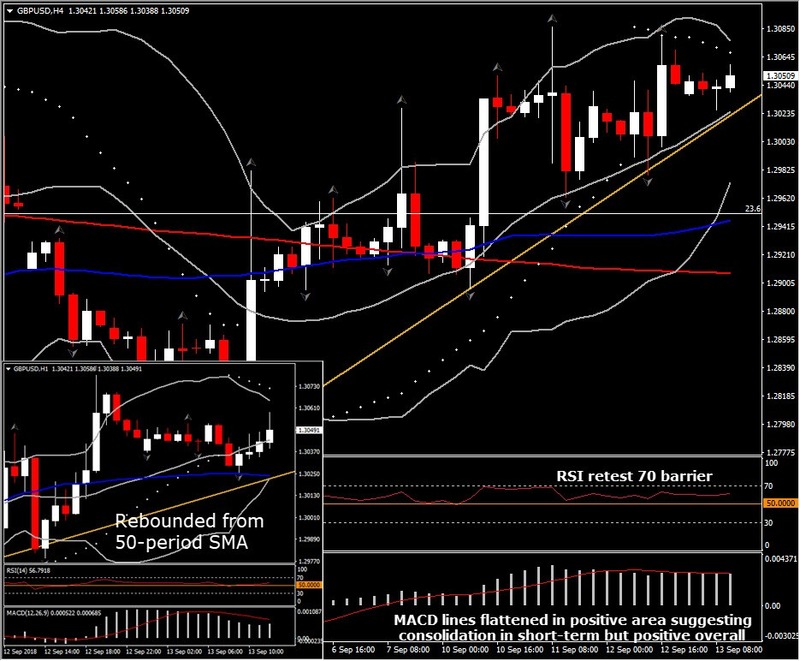 Cable has intraday Support at 1.2992-95 and intraday Resistance at 1.3085-88.